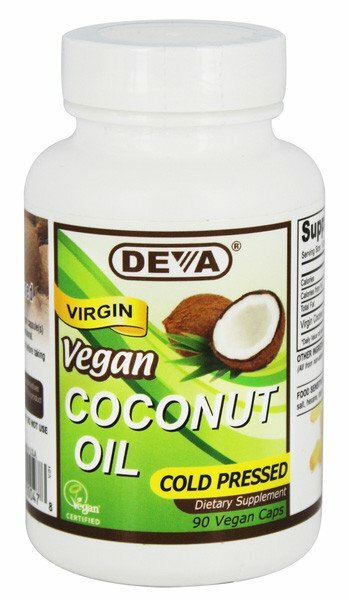 Deva Nutrition Organic Virgin Coconut Oil is cold-pressed and unrefined. Coconut oil is popular as a dietary supplement, for cooking and for cosmetics. Research shows that many of its health benefits come from its high levels of fatty acids, particularly medium chain triglycerides (MCT). The Virgin Coconut Oil used in this product is organic, cold-pressed and unrefined. Free of: Yeast, soy, wheat, gluten, starch, sugar, salt, hexane, dairy, egg, fish, artificial colour; animal products, byproducts or derivatives. Other Ingredients: Vegan Capsule, Organic Orange Oil, Silica. (All of the ingredients are from plant or mineral sources)Free of: Yeast, wheat, gluten, soy, starch, sugar, salt, hexane, dairy, egg, fish, artificial colour; animal products, byproducts or derivatives. For adults take one (1) or two (2) capsules daily with food, or as directed by a health care professional. Warning: Always consult your healthcare practitioner before using any dietary supplement. great product, and fast delivery.